Effects of rearing pet insects for improving mental health and salivary diurnal cortisol profile of elementary school children: A Pilot study. 1Department of Family Medicine, Kyungpook National University, Chilgok Hospital, Daegu, Korea. 3Division of Applied Entomology, National Academy of Agricultural Science, Rural Development Administration, Jeonju, Korea. Background: Insects can be potentially used in animal-assisted therapy to improve children’s mental illness. This study was performed to investigate the effects of pet insects on the mental health and diurnal cortisol profile among mentally healthy elementary school pupils. Methods: We enrolled 38 children without any psychological disorders and who met the inclusion criteria. Salivary cortisol profile (4 times/day), Attention deficiency and hyperactivity scale, self-esteem scale and daily hassles scale were evaluated at baseline and after 8 weeks. The subjects were educated every 2 weeks about the insects and how to rear them. They selected three different kinds of insects from among cabbage white butterfly, swallowtail butterfly, stag beetle, rhinoceros beetle, silkworm, or crickets, and reared them in their classroom for 8 weeks. Results: The subjects consisted of 19 boys and 19 girls and their mean age was 11.97 years. The diurnal salivary cortisol profiles (AM–Noon–PM–Night) changed from 4.30 ± 2.28, 2.79 ± 1.38, 2.64 ± 1.77, 3.67 ± 13.34 ng/mL at baseline to 5.51 ± 2.38 (P=0.041), 2.70 ± 1.14, 2.40 ± 0.78, 2.09 ± 2.26 after the experiment, respectively. The diurnal slope was steeper after the experiment than at baseline. Self-Esteem Scale and Daily Hassles Scale scores were 33.74 ± 3.06 and 44.61 ± 11.70 at baseline and 35.24 ± 4.70 (P=0.036) and 38.82 ± 12.95 (P=0.031) after the experiment, respectively. No significant changes were found in Attention Deficiency and Hyperactivity Scale scores. Conclusion: Rearing insects can be used for animal-assisted therapy, which resulted in beneficial effects on diurnal salivary cortisol, self-esteem, and daily stress for the children. Further studies investigating its effect for children and adolescents who are at risk for psychological disorders are needed. Animal-assisted therapy, Child, Insect, Stress, Self-esteem, Salivary cortisol. In school, children experience a broader social environment compared to that in their family. This presents an opportunity for greater self-confidence and positive development, if they are able to adapt while maintaining and developing good relationships with their teachers and peers. However, in reality, most modern-day children are faced with a changing media environment due to the advent of smartphones and the internet, an excessively competitive society, and accelerated weakening and disintegration of the functions of family. Growth and development are being threatened by internet addiction, selfishness, and results-oriented value systems [1,2]. Chronic psychological stress has a negative impact on children’s health, not only damaging overall psychological well-being, such as self-efficacy , but also affecting physical health. These effects involve the Hypothalamic- Pituitary-Adrenal (HPA) axis . In healthy individuals, the HPA axis follows a diurnal rhythm wherein cortisol levels peak within 30 min after waking up, and gradually decrease from the afternoon to evening . Acute stress raises cortisol levels above the baseline, but chronic, repeated stress can cause diurnal cortisol levels to show a flattened slope due to dysregulation of the HPA axis, leading to fatigue, depression, and attention impairment [4,6-9]. Animal-assisted therapy (AAT) helps to alleviate depression, improve heart rate, and relieve distress in children, and several studies have shown that AAT has positive effects on stress, mood, and distress in patients with mental health problems. Various species have been used in AAT, most commonly dogs, cats, birds and fish [10-13]. AAT provides emotional support, evokes diverse physiologic responses through human–animal interaction, and these responses involve various neurochemicals. These physiologic changes produce psychological and physical effects, leading to positive changes in mental health . Various species have been used in AAT, most commonly dogs, cats, birds and fish. However, to the best of our knowledge, the effects of using insects as a type of AAT to reduce stress and improve psychological health in children have not yet been demonstrated. Insects are more accessible to children than other animals, because they are less dangerous and smaller than other species, such as mammals; and included in the school curriculum in some countries; and insects have a large number of diverse species; further, caring for them is easy and inexpensive. Insects can also resolve the difficulties of encountering nature within cities. We hypothesized that empathy with living insects, as a species of AAT, could be expected to have positive effects on emotional stability and healing in children. Salivary cortisol level can be measured non-invasively and is a good indicator of circulating cortisol levels and the stress response [15,16]. In previous studies, salivary cortisol was strongly correlated with blood cortisol . In the present study, we aimed to investigate the effects of raising and empathizing with pet insects on the diurnal cortisol profile and psychological health of children. The subjects in this study were male and female pupils from grade 4-5 in a local elementary school, and the study was conducted during regular classes between October and December 2014. With the cooperation of a teacher and a school representative from a local elementary school, we obtained the consent of the pupils and a directly related guardian. The exclusion criteria for this study were as follows: (i) withdrawal of consent, (ii) history of mental health disorders (including Attention Deficit Hyperactivity Disorder [ADHD], depression and schizophrenia), (iii) current intake of psychiatric medications (including drugs that could affect attention), and (iv) current participation in another study. Forty-eight elementary school pupils in two classes agreed to participate in the study. Consent was obtained for 45 pupils, of whom 38 completed both salivary hormone tests. All research was conducted with the consent of a directly-related guardian, and the study plan was approved by an institutional review board (IRB) at a local hospital (protocol No. KNUH 2014-07-045). We selected the types of insect based on the opinions of etymologists and the species included in elementary school textbooks. The pupils were instructed to select from the following six insects: cabbage white butterfly, swallowtail butterfly, stag beetle, rhinoceros beetle, silkworm, and oriental garden cricket. Three types of insect were allocated to each classroom. Each classroom was provided five cages of each of their selected insects, with 4-5 butterflies per cage, 1-2 stag/rhinoceros beetles per cage and 5-8 crickets/silkworms per cage. The cages were designed to be suitable for raising and observing the corresponding insects, and the classes were provided with sufficient feed. At the initial visit, the pupils were provided instructions, so that they could directly raise, observe, feed and maintain a suitable environment for the insects. Thereafter, we visited every two weeks and educated the students, so that they could understand the insect’s life cycle, methods of rearing, and appropriate feed. Every session was delivered for 50 min during the regular school hours. The students were provided an opportunity to experience the different characteristics of each insect species through various methods besides educating about insects; such as experimenting on methods of flight in butterflies by using a flight mill, feeling rhinoceros beetle larvae, and making houses for adult rhinoceros beetles, experimenting scientific principles of crickets’ calls, and observing the insects’ structure and appearance using a microscope. We visited the subjects five times, including the baseline visit, and checked for any unexpected adverse effects or problems at every visit. Salivary cortisol and dehydroepiandrosterone (DHEA) levels were measured to examine the diurnal cortisol profile. Saliva samples were obtained at baseline and at the end of the intervention (after 8 weeks). The collection tubes were given to subjects in advance, and they were instructed to use a standardized sampling method to collect their own saliva samples. The saliva was collected 4 times per day, between 7 AM and 9 AM (AM), 11 AM and 1 PM (Noon), 4 PM and 6 PM (PM), and 10 PM and 12 AM (Night), and the samples were immediately stored in a freezer, with a temperature of <20°C. The subjects were instructed not to eat anything except water I h before the designated sample collection time; after rinsing the mouth with water, a cotton swab was placed in the mouth and chewed gently for 1-2 min before storing in a collection tube. On a designated day, the frozen saliva was retrieved in an icebox at a constant temperature and analyzed the next day. The saliva sample tubes were centrifuged for 10 min before cortisol and DHEA concentrations were measured using enzyme-linked immunosorbent assay. Cortisol level was measured from all four collected samples to analyze the diurnal variation; DHEA level was measured in the AM sample and the cortisol/DHEA ratio (C/D ratio) was calculated based on the AM cortisol and DHEA levels. To evaluate the degree of ADHD, the subjects were administered 18 questions based on the DSM-IV diagnostic criteria for ADHD . There were 9 questions each on attention deficiency and hyperactivity disorder; each question corresponds to 1 point and a higher score indicated more severe attention deficiency or hyperactivity disorder. The questionnaire was filled out directly by the subject’s main guardian and was collected on the following day. Self-esteem, which is the subjective evaluation of one’s own worth, was measured using a Korean translation of the Self-Esteem Scale developed by Rosenberg et al. (Cronbach’s α=0.79). This instrument evaluates the individual’s overall self-esteem and consists of five questions each on positive and negative self-esteem, respectively. The subject scored each question on a Likert scale from 1 point (‘Never’) to 4 points (‘Always’). Considering negative self-esteem questions as negative scores, a higher total score indicates higher self-esteem [19,20]. To investigate stress and changes in stress, we used the Korean Children’s Daily Hassles Questionnaire (DHQ), based on the DHQ developed by Muela et al. (Cronbach’s α=0.85). The questionnaire consists of 20 questions on peer-related stress, home environment-related stress, school and schoolwork-related stress, with each question scored on a Likert scale from 1 point (“Never”) to 4 points (“Always”). Higher scores indicate a higher stress level . The subjects responded to the self-esteem and stress questionnaires directly. All questionnaires were administered twice, at baseline and at the end of the intervention (after 8 weeks). IBM SPSS Statistics for Windows version 22.0 (IBM Corp., NY, USA) was used for all statistical analysis. An independent t-test, paired t-test, and Pearson Chi-square test were used to compare baseline and post-intervention characteristics between the two groups. A repeated measures analysis of variance was used to investigate daily variation in salivary cortisol levels. P values <0.05 were considered statistically significant in all tests. Of the 45 subjects who consented to the study during the recruitment period, 38 subjects completed all the pre- and post-intervention tests, and these subjects were included in the final analysis. The mean age of these 38 subjects was 11.97 ± 0.16 years and there were 19 male subjects (50%). No negative reports or incidents were observed during the five visits. The subjects showed normal daily cortisol level changes, with cortisol levels peaking in the morning, and gradually decreasing to a trough in the evening. The mean cortisol level was 4.30 ± 2.28, 2.79 ± 1.38, 2.64 ± 1.77, 3.67 ± 13.34 ng/mL in AM, Noon, PM, and night, respectively, which meant that the daily change was statistically significant (P<0.001 using the Greenhouse-Geisser correction). The subjects’ DHEA was 2.63 ± 0.75, making the C/D ratio 1.75 ± 0.98. The subjects’ AM cortisol level increased from 4.30 ± 2.28 at pre-intervention to 5.51 ± 2.38 ng/mL at postintervention and this was statistically significant (paired difference, 0.70 ± 2.04, P=0.041). The noon, PM, and night cortisol levels were 2.79 ± 1.38 and 2.70 ± 1.14, 2.64 ± 1.77 and 2.40 ± 0.78 and 3.67 ± 13.34 and 2.09 ± 2.26 at pre- and post-intervention, respectively, but these were not statistically significant. The DHEA levels also showed a decreasing trend, but this was not significant. The C/D ratio increased from 1.75 ± 0.98 at pre-intervention to 2.29 ± 1.32 at post-intervention, which was a significant change (paired difference, 0.54 ± 1.01, P=0.002) (Tables 1 and 2). Looking at the pattern of change in daily salivary cortisol level following the intervention, the significant increase in AM cortisol levels can be verified graphically (Figure 1). Attention deficit/hyperactivity scale: Based on the subject screening criteria, none of the subjects showed significant findings of attention deficiency or hyperactivity disorder. The attention deficiency index and hyperactivity index were 0.79 ± 1.56 and 0.96 ± 1.80 and 0.95 ± 1.55 and 0.61 ± 1.57, at pre- and post-intervention, respectively. In other words, the paired differences were 0.16 ± 1.4 and -0.24 ± 0.91 for attention deficiency (P=0.515) and hyperactivity indices (P=0.118), respectively and neither of these were significant changes (Table 1). Self-esteem scale and daily hassles scale: The Self- Esteem Scale and Daily Hassles Scale scores were 33.74 ± 3.06 and 44.61 ± 11.70 and 35.24 ± 4.70 and 38.82 ± 12.95 at pre- and post-intervention, respectively. Thus, the paired differences were 1.50 ± 4.25 and -5.79 ± 15.88 for the Self-Esteem (P=0.036) and Daily Hassles Scale scores (P=0.031), respectively, which were both statistically significant. We conducted a pilot study to investigate the effects of experience and education of directly rearing pet insects in children. We demonstrated the potential possibility of positive psychological and physical changes in children via the experience with insects, showing improved selfesteem, alleviated stress and a beneficial effect on the diurnal cortisol profile. AAT using living organisms is used as a type of psychotherapy in children. In children with behavioral problems, animal-assisted psychotherapy shows positive effects not only on clinical symptoms, such as depression, sense of inadequacy, and social skills, but also on personal adjustment and adaptive skills . Various species have been used in AAT. Children with ADHD showed improvements in interpersonal relationships, clinical symptoms, gait balance, and brain connectivity following equine AAT [23-25]. AAT using dogs showed significant improvement in clinical symptoms and social functioning and quicker realization of treatment objectives in children with mental disabilities [26-28]. AAT not only provides emotional support, but also evokes diverse physiologic responses through human–animal interaction involved in attention-seeking behaviors, and these responses involve various neurochemicals, such as β-endorphin, oxytocin, prolactin, phenylacetic acid, dopamine and cortisol. These physiologic changes produce psychological and physical effects, leading to positive changes in mental health . However, for most parts, AAT in children and adolescents has mostly been studied using large mammals, such as horses, dogs, and cats, which require considerable space and expenses . To the best of our knowledge, no studies have used insects yet. Pet insects are inexpensive, require little space, and are easy to handle. Feed is easy to acquire, and the growth process is fast, making it more convenient to observe. For these reasons, we expected that insects could be a useful AAT tool for children. In a previous study on pet insects for the elderly, we demonstrated that caring for pet insects had a small-to-medium positive effect on the mental health of the elderly . In that study, positive changes in cognitive function and depression were found in community-dwelling elderly individuals compared with a control group when they were provided with insects to rise. Thus, in the present study, we used various pet insects to study their effects on mental health in children. As previously mentioned, exposure to stress in children is directly related to daily cortisol output [7-9]. Negative social experiences are associated with a more negative cortisol slope in children and the HPA axis is overstrained, and cortisol production is downregulated following exposure to chronic stress . As a result, children under chronic stress show a flattened diurnal slope, whereas a healthy diurnal cortisol slope shows a steep curve that peaks immediately after waking and rapidly declines during the daytime [32,33]. 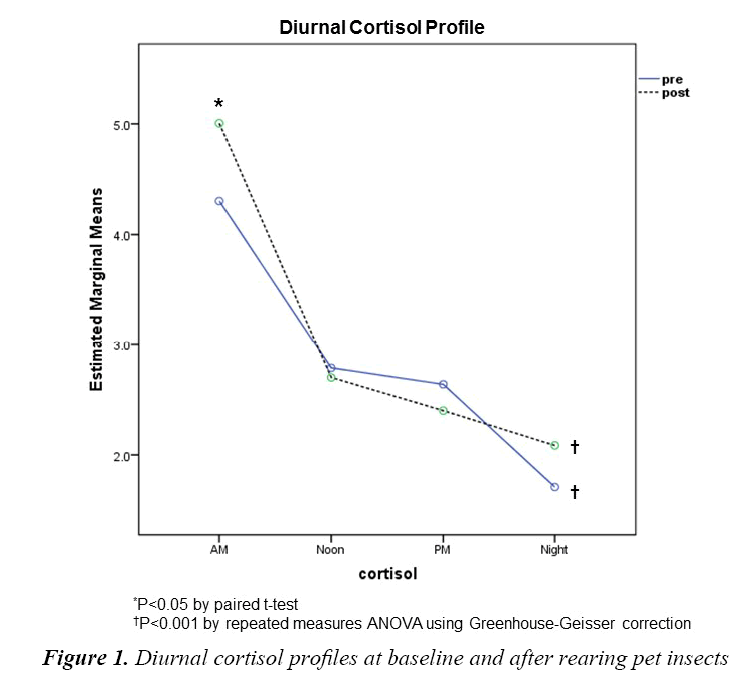 In the present study, we inspected changes in the diurnal cortisol profile after providing subjects with an experience of rearing pet insects, and a significant increase in AM cortisol level and an even steeper curve after the intervention were observed. The fact that a strong cortisol awakening response was observed, with an increase in morning cortisol levels within 30 min of waking and no significant increase in lunchtime, afternoon or nighttime, was considered a positive outcome. However, the interpretation could be controversial because the subjects showed low mean cortisol levels of 10 ng/mL, which can be considered as hypocortisolism, suggesting that the subjects might be under chronic stress and in the early stages, cortisol level, could have possibly increased as a healthy HPA axis response to acute stress . Studies will be conducted in children with underlying psychopathological disorders, such as depression, to overcome these limitations in the future. In psychological assessments, the subjects in this study showed significant positive changes in Self-Esteem and Daily Hassles Scales. This is consistent with a previous study showing that AAT had a special role in the social–emotional development in children . AAT is particularly thought to increase self-esteem, autonomy, and empathy for others, and to have stress-buffering effects by improving social competence [35,36]. Moreover, the positive changes in Self-Esteem and Daily Hassles Scales support the changes in the diurnal cortisol slope. Based on the results of our study, we can expect insects to be usable as a type of AAT. Although our study did not show any significant change in ADHD score following the intervention, this could be considered an obvious result, given that we only recruited subjects with no significant attention deficiency or hyperactivity at baseline. The attention deficiency and hyperactivity scores of children in this study were both below 1 point on average, which meant that the subjects were typical elementary school pupils without any problems in this area. Given that a study using equine AAT on children ADHD produced improvements in clinical symptoms, follow-up studies will be required to determine the effects of pet insects on children with ADHD [23-25]. Our study had several limitations. First, because we only examined a small number of elementary school pupils from a single restricted urban area, we had difficulties in generalizing the results and some selection bias could have been present. The lack of a control group was another limitation. Since this was a pilot study, we only examined the possibility of using pet insects as a type of AAT, but future studies based on our results will need to include a randomized controlled trial with a control group. Finally, as previously mentioned, the interpretation of the cortisol profile could be controversial, which is affected by acute stress. Particularly, academic examinations and infectious disease can easily affect the cortisol profile. To minimize these factors, we deliberately conducted the study outside of examination periods and excluded subjects currently taking medication. Nevertheless, we could not control all sources of stress individually. Despite these limitations, our study is important as the first study to use pet insects as a form of AAT in children. The fact that we analyzed the diurnal cortisol profile and various psychological tests together is strength of this study. Moreover, it is significant that this was a prospective study, wherein we minimized bias by avoiding examination periods and screening subjects based on medication intake and disease. Raising insects is safe, requires little space and is costeffective, and the methods of rearing are easy. Furthermore, because the processes of growth and change are relatively fast, they readily generate interest and excitement in children and adolescents, and can be conveniently linked to the elementary school curriculum. Providing children with direct experience and education using pet insects induced beneficial cortisol profile changes, improved self-esteem, and reduced stress. We expect that insects could be used effectively in AAT through linkage with the academic curriculum. To prove this, randomized controlled trials on children in specific disease groups are needed. Do JS, Sung JM. The effects of youth activity on sociality development. J Adolesc Welfare 2013; 15: 145-173. Lee SA. Pathways from stress to adolescent internet usage times: The mediating effects of emotional regulations, parental attachment and depression. Korean J Fam Welfare 2008; 13: 103-122. Moeini B, Shafli F, et al. Perceived stress, self-efficacy and its relations to psychological well-being status in Iranian male high school students. Soc Behav Pers 2008; 36: 257-266. Repetti RL, Taylor SE, Seeman TE. Risky families: Family social environments and the mental and physical health of offspring. Psychol Bull 2002; 128: 330-366. Adam EK, Hawkley LC, Kudielka BM, et al. Day-to-day dynamics of experience--cortisol associations in a population-based sample of older adults. Proc Natl Acad Sci U S A 2006; 103: 17058-17063. Collomp K, Baillot A, Forget H, et al. Altered diurnal pattern of steroid hormones in relation to various behaviors, external factors and pathologies: A review. Physiol Behav 2016; 164: 68-85. Gunnar MR, Vazquez DM. Low cortisol and a flattening of expected daytime rhythm: Potential indices of risk in human development. Dev Psychopathol 2001; 13: 515-538. Adam EK, Doane LD, Zinbarg RE, et al. Prospective prediction of major depressive disorder from cortisol awakening responses in adolescence. Psychoneuroendocrinology 2010; 35: 921-931. Goodyer IM, Herbert J, Tamplin A, et al. Recent life events, cortisol, dehydroepiandrosterone and the onset of major depression in high-risk adolescents. Br J Psychiatry 2000; 177: 499-504. Barker SB, Dawson KS. The effects of animal-assisted therapy on anxiety ratings of hospitalized psychiatric patients. Psychiatr Serv 1998; 49: 797-801. Kaminski M, Pellino T, Wish J. Play and pets: The physical and emotional impact of child-life and pet therapy on hospitalized children. Children Health Care 2002; 31: 321-335. Nepps P, Stewart C. Animal-assisted therapy: effects on stress, mood and pain. J Lancaster Gen Hosp 2011; 6: 2. Palley LS, O'Rourke PP, Niemi SM. Mainstreaming animal-assisted therapy. ILAR J 2010; 51: 199-207. Tornhage CJ. Salivary cortisol for assessment of hypothalamic-pituitary-adrenal axis function. Neuroimmunomodulation 2009; 16: 284-289. Vining RF, McGinley RA, Maksvytis JJ, et al. Salivary cortisol: A better measure of adrenal cortical function than serum cortisol. Ann Clin Biochem 1983; 20: 329-335. Inder WJ, Dimeski G, Russell A. Measurement of salivary cortisol in 2012 - Laboratory techniques and clinical indications. Clin Endocrinol (Oxf) 2012; 77: 645-651. American Psychiatric Association: Diagnostic and Statistical Manual of Mental Disorders, fourth edition (DSM-IV). 4th ed. Washington, DC: American Psychiatric Association 1994. Rosenberg M. Society and adolescent self-image. 1965, Princeton, NJ: Princeton University Press. Korea University Science & Technology Research Institute. Psychological scale handbook II. Seoul, Korea: Hakjisa 2000. Han MH, Yoo JY. Development of daily hassles scale for children in Korea. Fam Environ Res 1995; 33: 49-64. Muela A, Balluerka N, Amiano N, et al. Animal-assisted psychotherapy for young people with behavioural problems in residential care. Clin Psychol Psychother 2017. Garcia-Gomez A, Rodriguez-Jimenez M, Guerrero-Barona E, et al. Benefits of an experimental program of equestrian therapy for children with ADHD. Res Dev Disabil 2016; 59: 176-185. Hyun GJ, Jung TW, Park JH, et al. Changes in gait balance and brain connectivity in response to equine-assisted activity and training in children with attention deficit hyperactivity disorder. J Altern Complement Med 2016; 22: 286-293. Jang B, Song J, Kim J, et al. Equine-assisted activities and therapy for treating children with attention-deficit/hyperactivity disorder. J Altern Complement Med 2015; 21: 546-553. Elmaci DT, Cevizci S. Dog-assisted therapies and activities in rehabilitation of children with cerebral palsy and physical and mental disabilities. Int J Environ Res Public Health 2015; 12: 5046-5060. Stefanini MC, Martino A, Allori P, et al. The use of animal-assisted therapy in adolescents with acute mental disorders: A randomized controlled study. Complement Ther Clin Pract 2015; 21: 42-46. Wohlfarth R, Mutschler B, Beetz A, et al. Dogs motivate obese children for physical activity: Key elements of a motivational theory of animal-assisted interventions. Front Psychol 2013; 4: 796. Odendaal JS. Animal-assisted therapy - Magic or medicine? J Psychosom Res 2000; 49: 275-280. Siewertsen CM, French ED, Teramoto M. Autism spectrum disorder and pet therapy. Adv Mind Body Med 2015; 29: 22-25. Ko HJ, Youn CH, Kim SH, et al. Effect of pet insects on the psychological health of community-dwelling elderly people: A single-blinded, randomized, controlled trial. Gerontology 2016; 62: 200-209. Deater-Deckard K. Annotation: Recent research examining the role of peer relationships in the development of psychopathology. J Child Psychol Psychiatry 2001; 42: 565-579. Koss KJ, Hostinar CE, Donzella B, et al. Social deprivation and the HPA axis in early development. Psychoneuroendocrinology 2014; 50: 1-13. Cetinkaya S, Ozon A, Yordam N. Diagnostic value of salivary cortisol in children with abnormal adrenal cortex functions. Horm Res 2007; 67: 301-306. Endenburg N, van Lith HA. The influence of animals on the development of children. Vet J 2011; 190: 208-214. Heinrichs M, Baumgartner T, Kirschbaum C, et al. Social support and oxytocin interact to suppress cortisol and subjective responses to psychosocial stress. Biol Psychiatry 2003; 54: 1389-1398.